Girls Just Wanna Have Guns - �.99 delivered. 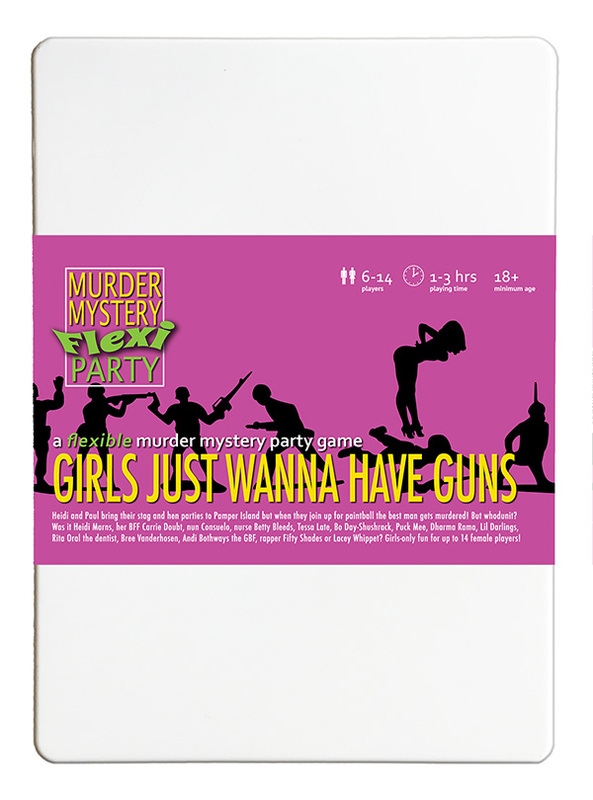 The perfect murder mystery for a hen night or girls night in. Engaged couple Heidi and Paul are throwing their pre-parties at luxury spa and adventure resort, Pamper Island. But after one too many drinks, the bride and her entourage are invited to 'hunt the stag' with paintball guns. The groom is quickly found and paintballed head to toe, but nobody can find best man Steve Wingman, who has met a grisly end. Grab your guns and get ready for a facial at the luxury spa and adventure resort of Pamper Island! *full instructions included in the box. Take the stress out of hosting with our bestselling brand! * Play with ANY combination of 6-14 guests. No-one is 'bolted on', everyone's a suspect. * The murderer is chosen on the night so the party still goes on if someone can't make it! * No random guessing! Suspects have different stories if they're guilty, with important clues to help you solve whodunit. An excellent way to spend a role-playing evening with friends. Each party takes 2-3 hours to play. They are filled with intrigue, suspense, humour and the fun of playing both detective and suspect. This game is designed to be played by up to 14 female players, in any combination (minimum of 6). SUITABLE FOR AGE 18 YEARS AND OVER. Contains adult themes and plentiful innuendo. Name / nickname Reviews are individually approved by the store so no profanity please! Trouble working out whodunit? Tell us here.